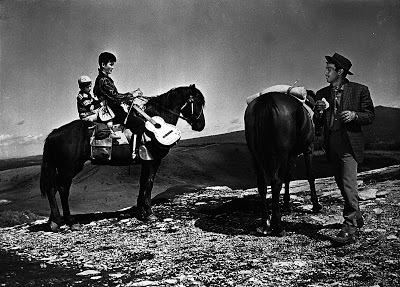 Buichi Saito’s 1960 feature Plains Wanderer, the fifth installment of a popular nine-part series, is a sterling example of the “Eastern Western” genre, a popular staple of Nikkatsu action films. These films used the iconography of the American Western, but added unique characteristics of Japanese culture and history, and in the case of Plains Wanderer, crossed it with the gangster film genre. Akira Kobayashi, one of Nikkatsu’s biggest stars, played the wanderer in this series, a lone hero who wanders into various towns, a figure akin to those played by Randolph Scott in Budd Boetticher’s westerns, although Kobayashi was far less taciturn and stoic than Scott. Taki (Kobayashi), a wandering, singing cowboy, comes upon a village in Hokkaido populated by the Ainu, aboriginal people of Japan. 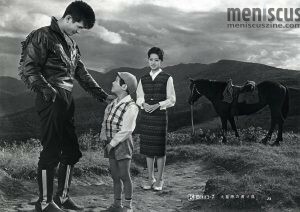 He brings in tow Nobuo (Toshio Egi), a boy abandoned by his mother, whom Taki is searching for. Taki becomes drawn into the conflict the villagers are having with Kodo (Nobuo Kaneko), a rapacious bar owner and developer, who wants to take over their land for tourist construction. Also in the mix is Junko (Ruriko Asaoka), the owner of an arts and crafts shop selling Ainu craftworks, and who is conducting an anthropological study of the Ainu. Her interest is not merely an intellectual one; she loves and wants to protect these people. Her father-in-law Kiyosato (Yuzo Kiura) has mortgaged the Ainu land to Kodo, and he struggles to pay back the loan, but it is soon becomes clear that Kodo is less interested in being repaid than in making profit off the Ainu village land. Junko is engaged to Shigeru, Kiyosato’s dimwitted son. Her doubts about the impending marriage are only exacerbated by the arrival of the dashing Taki. Also complicating matters is Junko’s friend Setna (Mari Shiraki), an Ainu village girl who is in love with Shigeru. Taki’s main foil is Masa (Jo Shishido), Todo’s wisecracking henchman, who crosses paths with Taki frequently, challenging him to fights. Masa is the sort of wry heavy who would be played in an American Western by Lee Marvin. The Wanderer series, much like other popular Japanese film series such as the Zatoichi series, followed the same template in each film: Kobayashi as the lone figure drifting into town who has a romantic relationship with a local woman played by Asaoka (Kobayashi and Asaoka were in fact a real-life romantic couple for a time), with Shishido as Kobayashi’s antagonist. Kobayashi would also frequently break out into song, making him a pop-music sensation as well as a movie star. In Plains Wanderer, Kurataro Takamura’s widescreen cinematography, featuring Hokkaido’s picturesque landscapes, lends an appropriately iconic Western flavor to the proceedings. What emerges as the film’s main theme is a clash of civilizations: the Ainu, an uncorrupted, pre-modern culture, is threatened by the decadent, Westernized modern world, populated by violent, greedy gangsters. The eclectic mixture of tradition, mythology, and modernism is a recurring feature of the film. Taki in his black leather cowboy outfit and Setna in her Ainu dress both stand out starkly in the modern hostess bar in the city. The American Western influences also contrast with the Ainu rituals depicted in the film, represented by the wizened fortuneteller woman and the bear dance festival, while the film’s conclusion directly evokes the similar ending of George Stevens’ Shane.